Phil and Jackie Pope enjoyed beignets and chicory coffee during a recent layover with flight attendant friends at Café Du Monde in New Orleans. Phil was released from a hospital April 2 after recovering from a stroke in February. 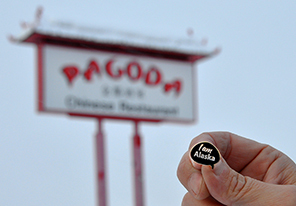 As Phil Pope recovered from a stroke at a hospital near Seattle, the retired Alaska Airlines captain had a hankering for one particular thing: Chinese food from Pagoda Restaurant in North Pole, Alaska. That’s where he and wife Jackie Pope, an Alaska Airlines flight attendant, planned to celebrate their 25th wedding anniversary Feb. 11, near the rustic cabin where they live every summer. Since the Popes couldn’t travel to North Pole, their friends reasoned, why not send the food to them? 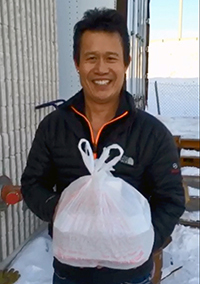 The “I am Alaska” spirit helped deliver Chinese food to Seattle all the way to the Pagoda restaurant in North Pole, Alaska. North Pole is a small city about 14 miles outside Fairbanks. It is Christmas year-round in North Pole, home of the famed Santa Claus House, a post office that receives hundreds of thousands of letters to Santa every year, and, according to some, the best Chinese food in the entire state. In a feat of superb logistics and coordination by family, friends and Alaska Airlines employees, the meal was successfully delivered from the wok at the Pagoda to a table at the hospital, complete with chopsticks and fortune cookies. For the special anniversary meal, hospital staff members even decorated an onsite apartment with a cloth tablecloth, napkins, flowers and a candle. Phil and Jackie shared leftovers with hospital employees, who have been a key part of Phil’s recovery. Because of his positive attitude and hard work, Phil was released from rehabilitation April 2. Phil and Jackie met on a Seattle-Anchorage-Fairbanks flight in 1987, and they were married three years later. Phil was hired in 1964 at Alaska Airlines, where he worked on the ramp and in operations. In 1966, he became a pilot, and he retired as a captain in 2002 after 38 years of service. Jackie was hired in 1976 as a flight attendant and she’s still flying today. In 2013, she received the company’s prestigious Customer Service Legend award. “We are an Alaska Airlines family,” Jackie said. Cook stopped by the Pagoda to talk with Benny, who quickly got on board with the plan. Cook also connected with the Alaska Airlines office in Fairbanks, to see if such a delivery was even possible. He explained that it was for Phil Pope, who is known and loved by Fairbanks airport employees. About 2:30 p.m. March 3, Cook arrived at Pagoda with a big red Coleman cooler and ice packs. Benny had prepared the food and boxed it up: Mongolian beef, cashew chicken and his famous honey walnut shrimp. Benny packed the sauces separate, so the food wouldn’t get soggy, and included detailed instructions on how to reheat everything. Cook took the cooler to Alaska’s cargo office in Fairbanks, where station supervisor Frank Ryman gave the package “GoldStreak” status to ensure it made the next flight. 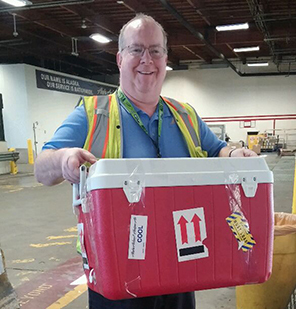 Seattle-based air freight CSA Eric Neilson did his part to deliver the cooler of Chinese food to Phil Pope. The food arrived in Phil’s hospital room about 10:30 a.m. March 4, just in time for lunch. Jackie and Phil had no idea it was coming. The special delivery created a buzz in the rehab department – nobody believed that anyone could pull off such a feat. 1 comment on "Seattle hospital patient requests special meal from North Pole – Alaska delivers"
Almost as good as what Alaska Airlines does at Christmas for the kids on Adak.